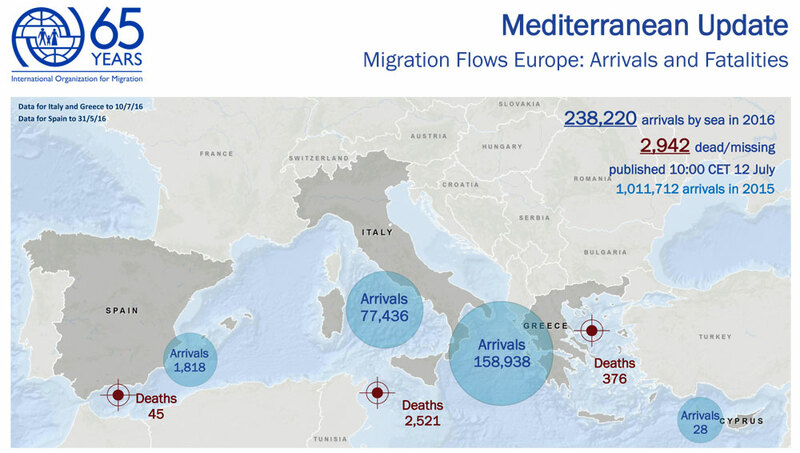 Italy - IOM reports an estimated 238,220migrants and refugees entered Europe by sea in 2016 through 10 July, arriving mostly in Italy and Greece. So far this year an estimated 2,942 deaths have been recorded, compared with 1,838through the first six months of 2015, and 1,906 through 12 July last year. IOM Tunisia reported this week on a shipwreck of a Europe-bound trawler carrying 28 migrants – mainly young adults from Ben Guerdane region of Tunisia. It reportedly sank off the Libyan coast near the city of Sabratha. Reports of bodies recovered and migrants still missing are as yet inconclusive. Meanwhile, IOM Greece reports there have been no drownings on the Eastern Mediterranean route between Turkey and Greece since March. However, three migrants died in Greece during June. Two refugee boys from Iraq, aged 12 and 14, were found dead in a municipal water tank in a rural area near Pieria, northern Greece. A 32-year-old Egyptian man also died at the Souda accommodation site on Chios island. He was stabbed for unknown reasons while attempting to separate two compatriots who were quarreling. A 31-year-old suspect was arrested. IOM Rome spokesman Flavio Di Giacomo reports over 2,200 migrants have been rescued and brought to Italy since 6 July, noting that not all of them have been included in total arrivals to Italy for 2016. A further 561 arrivals were registered in Greece through the first 10 days of July. Most Italian rescue operations have occurred in the Channel of Sicily. Rescued migrants and refugees are usually brought to ports in Sicily (Catania, Augusta, Porto Empedocle, Pozzallo and Palermo), Lampedusa, Calabria (Reggio Calabria, Crotone) and Apulia (Taranto). With staff deployed at the main landing points in Sicily (including Lampedusa), Calabria and Apulia, IOM in Italy provides legal assistance to those arriving by sea, monitors reception conditions and supports the authorities in the identification of vulnerable groups. In Greece, IOM has staff in Lesvos, Samos, Chios, Leros and Crete, where it works closely with the relevant authorities to identify vulnerable migrants, including unaccompanied minors, the elderly, people with medical needs and families with children. Vulnerable groups are referred to the relevant authorities to receive the necessary care. 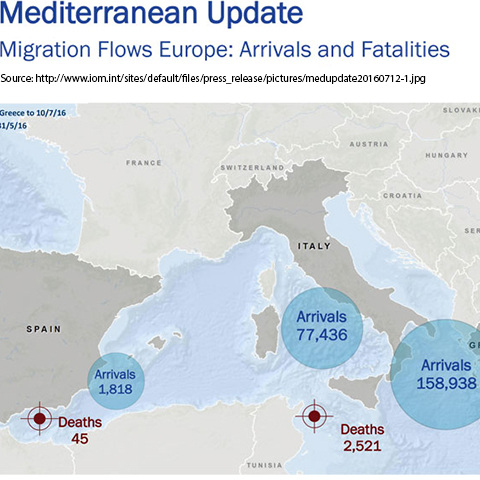 Data on deaths of migrants compiled by IOM GMDAC. All numbers are minimum estimates. Arrival estimates based on data from respective governments and IOM field offices.